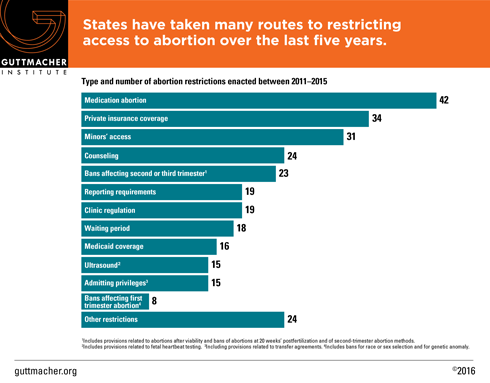 During the 2015 state legislative session, lawmakers considered 514 provisions related to abortion; the vast majority of these measures—396 in 46 states—sought to restrict access to abortion services. This year will be remembered not only because 17 states enacted a total of 57 new abortion restrictions, but also because the politics of abortion ensnared family planning programs and providers as well as critical, life-saving fetal tissue research. At the same time, several states made important advances in 2015 on other sexual and reproductive health and rights issues Some of the new provisions include measures that allow women to obtain a full year’s worth of prescription contraceptives at one time from a pharmacy, allow a provider to treat a patient’s partner for an STI without first seeing the patient, prohibit the use of conversion therapy with minors and expand access to dating or sexual violence education. See the full analysis here for details. Including the 57 abortion restrictions enacted in 2015, states have adopted 288 abortion restrictions just since the 2010 midterm elections swept abortion opponents into power in state capitals across the country. To put that number in context, states adopted nearly as many abortion restrictions during the last five years as during the entire previous 15 years. 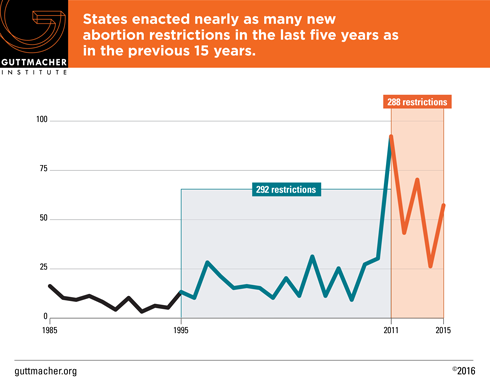 Moreover, the sheer number of new restrictions enacted in 2015 makes it clear that this sustained assault on abortion access shows no signs of abating. The 288 new restrictions enacted since 2010 include a broad range of approaches, from banning some abortions to putting restrictions on the providers allowed to perform the procedures to limiting insurance coverage. Thirty-one states—spanning all regions of the country—enacted at least one abortion restriction during the last five years. 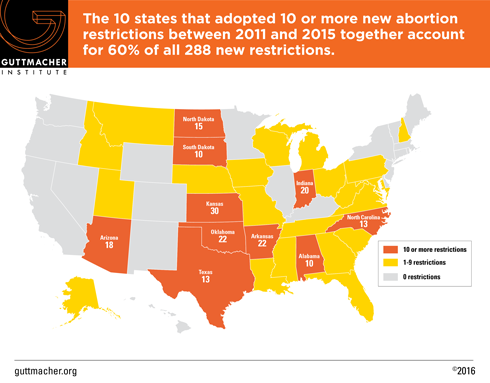 The 10 states that enacted at least 10 new restrictions together account for 60% of the 288 new abortion restrictions adopted over the last five years. These states are overwhelmingly located in the South and the Midwest, and it is likely that access to services for women in these regions has been impacted significantly. Four states—Arkansas, Indiana, Kansas and Oklahoma—each enacted at least 20 new abortion restrictions, making this handful of states, which together adopted 94 new restrictions, responsible for a third of all abortion restrictions enacted nationwide over the last five years. Kansas has the dubious distinction of leading the pack with 30 new abortion restrictions since 2010. Although the 57 new abortion restrictions enacted during 2015 include a wide range of provisions, four topics stood out as the subject of particular attention among lawmakers. Five states adopted new (FL and TN) or lengthened existing (AR, NC and OK) waiting period legislation in 2015. See the full analysis here for details. (The new Florida law has been temporarily blocked by the courts; the Oklahoma law is also being challenged, but a state court allowed it to go into effect while the case is pending.) Including these new laws, 27 states have waiting periods in effect (see Counseling and Waiting Periods for Abortion). The new laws in Florida and Tennessee require the woman to receive state-mandated abortion counseling in person, meaning that she must make two separate trips to obtain an abortion. With enforcement of the Florida law blocked, 13 states have two-trip requirements in effect. Three states sought to use longstanding strategies to restrict access to medication abortion. Arkansas, Idaho and Kansas enacted new measures banning the use of telemedicine for the provision of medication abortion. Arkansas also mandated use of the regimen specified in the FDA-approved labeling, which bans use of the newer evidence-based regimen that is less costly, has fewer side effects and can be used several days later in pregnancy; the law is not in effect due to a court case. Currently, 18 states ban use of telemedicine and four mandate use of the older medication abortion regimen (see Medication Abortion). Arizona and Arkansas debuted a new approach to discouraging a woman from obtaining a medication abortion. Both states adopted laws requiring doctors to counsel women that the abortion could be stopped if the woman takes a high dose of progesterone after receiving the first of the two drugs included in the medication abortion regimen. According to the American Congress of Obstetricians and Gynecologists, this new approach is based on scant scientific evidence; it relies on a single flawed study of only six cases that did not have oversight by an institutional review board. The Arizona law is blocked pending a legal challenge; the Arkansas law is in effect. Abortion opponents unveiled a new strategy in 2015 by moving to ban the use of the procedure used most often for second-trimester abortions. Kansas and Oklahoma both enacted measures to ban this safe and medically proven method that has long been used for abortions after 14 weeks; both laws are enjoined pending court action. West Virginia and Wisconsin enacted laws banning abortion at or after 20 weeks postfertilization (which is equivalent to 22 weeks after the woman’s last menstrual period). The West Virginia measure is in effect; the one in Wisconsin is slated to go into effect in February. Currently, 12 states have similar bans in effect (see State Policies on Later Abortions). Even as the stage was being set for the U.S. Supreme Court to review TRAP laws (see above), legislative action continued apace in several states. Five states adopted TRAP laws in 2015. Following a 2014 ballot initiative that granted lawmakers the ability to enact virtually limitless abortion restrictions, Tennessee enacted a new TRAP law that requires abortion providers to meet the standards that apply to ambulatory surgical centers even though these centers typically provide more invasive and risky procedures than abortion and use higher levels of sedation than commonly provided in abortion clinics. Arkansas, Indiana, Ohio and Oklahoma made existing requirements more stringent. See the full analysis here for details. In the aftermath of the release of a series of deceptively edited sting videos aimed at Planned Parenthood, attempts to defund the organization have flared at both the federal and state levels. By the end of 2015, some 11 states had moved to slash funding either for Planned Parenthood health centers specifically or for any family planning provider that also offers abortion services. 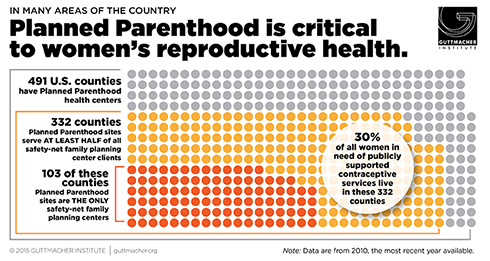 A Guttmacher analysis shows that defunding Planned Parenthood could seriously impair women’s access to needed services: In two-thirds of the 491 counties in which they are located, Planned Parenthood health centers serve at least half of all women obtaining contraceptive care from safety-net health centers. In one-fifth of the counties in which they are located, Planned Parenthood sites are the sole safety-net family planning center. Mirroring events in Congress, five states—Alabama, Arkansas, Louisiana, Oklahoma and Texas—took steps to exclude Planned Parenthood from the Medicaid program in 2015. These efforts were blocked by federal courts in Alabama, Arkansas and Louisiana; a challenge was just filed in November in Texas. Similar efforts made by Arizona and Indiana in recent years were also rebuffed by federal courts. Ten states already limit eligibility for family planning funding (see State Family Planning Funding Restrictions). Eight of these states—Arizona, Arkansas, Colorado, Indiana, North Carolina, Ohio, Texas and Wisconsin—prohibit abortion providers from receiving state family planning dollars. Kansas and Oklahoma exclude family planning providers not operated by public entities from eligibility. North Carolina and Utah moved to exclude family planning providers from eligibility for funding for related services. Legislation enacted in North Carolina bars family planning providers that offer abortion services from receiving funding for adolescent parenting and teen pregnancy prevention programs. Utah Gov. Gary Herbert (R) directed the state department of health to discontinue any funding for Planned Parenthood health centers, including funding for STI surveillance efforts, STI testing and treatment and abstinence education; a federal appellate court recently prohibited the state from excluding Planned Parenthood from the funds. As yet another consequence of the release of the Planned Parenthood sting videos, 10 states moved to regulate either the process for fetal tissue donation or biomedical research conducted in the state using fetal tissue resulting from induced abortions. Fetal tissue research has been integral to many of the major medical advances of our age. For example, fetal cell lines were used in the development of the polio vaccine and vaccines for diseases such as measles, mumps, rubella, chickenpox, hepatitis A and rabies. In short, fetal tissue research has saved and improved the lives of millions of people worldwide. During the final months of 2015, North Carolina and Arizona moved to regulate fetal tissue donation and research. A law enacted in North Carolina prohibits the sale of fetal tissue for a profit, paralleling federal requirements. Arizona adopted an emergency regulation requiring facilities to report any donation of fetal tissue to the state. Measures related to fetal tissue donation and research were introduced in Alabama, California, Michigan, New Jersey, Ohio, New York and Wisconsin. See the full analysis for more details.